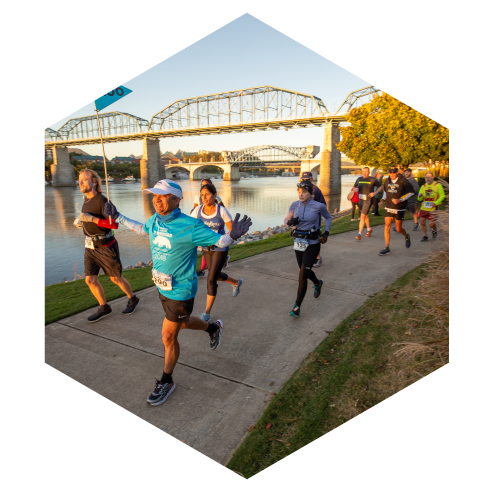 Returning this year at 7 Bridges – the 4 person Marathon Relay and the 2 person Half Marathon Relay – a great way to experience the excitement of a marathon through scenic downtown Chattanooga. The Marathon Relay will follow the 7 Bridges Marathon course and will consist of a 4 member team, you and 3 of your friends each running varying distances between 5 and 8 miles. The Half Marathon Relay will consist of 2 team members each running half of the 4 Bridges Half Marathon course. Awards will be given to the fastest Women’s Team, fastest Men’s Team, and fastest Mixed Team. An award will also be give to the overall fastest Masters Team. Put together your relay team for these fun events now! Big White Tent on south end Tremont Street. 5-9 am for Kids K ONLY. NO REGISTRATION on race day! Coolidge Park near the Blue Rhino sculpture on the south end Tremont Street. The course (click here) will start at Cherokee Blvd and the entrance to Renaissance Park. Additional course with elevation profile (click here). Athletes will turn right onto Cherokee, right onto Market Street Bridge, right on Aquarium way, right on Chestnut, left on Riverfront Parkway, then turn around near Broad Street, and right on Power Alley, left on 3rd Street, right on Chestnut Street, right on 4th Street, right onto Highway 27, exit at Manufacturers Boulevard, right into Renaissance Park, follow the Rriverwalk through Coolidge Park, left on Tremont, right on Fraizer, right onto Georgia Ave (Veterans Bridge), right onto Riverfront Parkway, left onto Riverfront Parkway (head west in east bound lane), left onto Dupont Parkway (C.B. Robinson bridge), right onto Access Road, through traffic circle onto Highway 153 (Thrasher Bridge/Dam), exit right onto Amnicola Highway, right at TVA Access Road to Riverwalk, left on Riverwalk, (follow Riverwalk to Battery Place). Continue on Riverwalk to the Art District on Spring Street. Left on 2nd Street, left on High Street, right on 3rd Street, right on Walnut Street, right on Frazier, right on Tremont, follow Riverwalk into Coolidge park, and finish in field near Carousel. All finishers will receive a medal, age group awards will be shortly after the last finisher.